Free Peer Learning is offered to all AAP students who want to strengthen their abilities to think critically and independently, read analytically, write well, reason quantitatively, and study effectively while mastering course materials. Every year, we train over 130+ Peer Learning Facilitators (mostly successful upper division AAP students) to work as Peer Learning Facilitators (PLFs) and to serve as academic role models. The Unit provides Peer Learning Sessions to almost 2,000 AAP students every week. 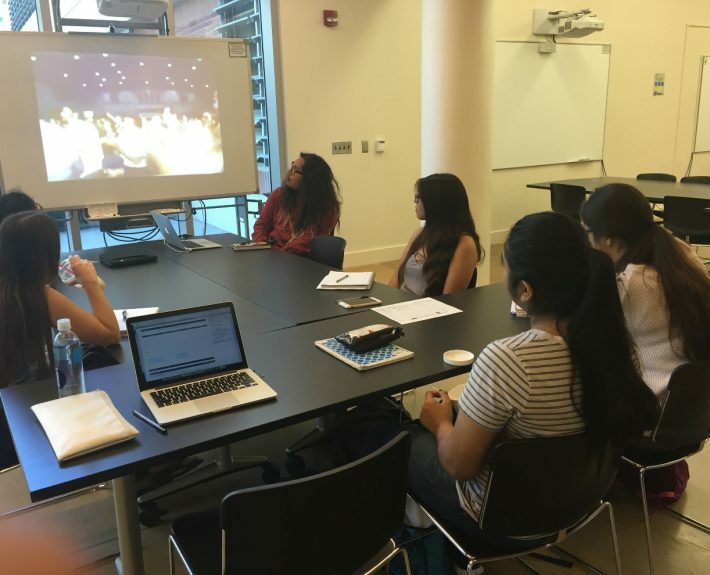 AAP Peer Learning sessions offer students an opportunity to shape their own educational experiences – and to excel. The Peer Learning Unit builds on the premise that critical thinking and intellectual independence are developed through questioning and dialogue. Most of our Peer Learning sessions take place in small groups of three to twelve students. This setting fosters discussion and allows students to listen to, grapple with, and articulate new perspectives. 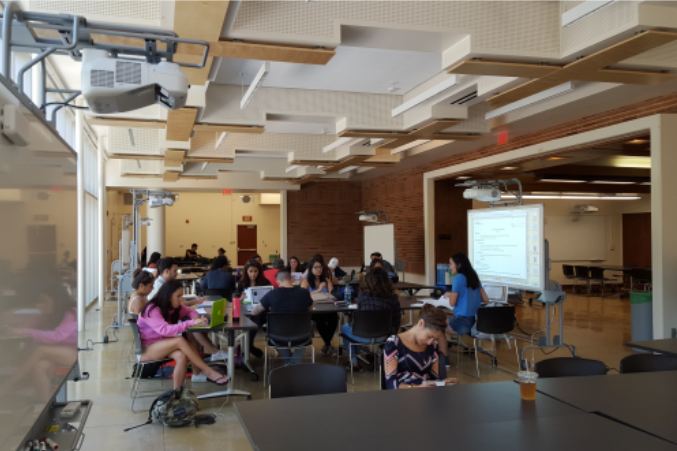 It enables students to work collaboratively, helping them to see that they can rely on classmates as well as Peer Learning Facilitators; it helps students develop the tools necessary for scholarly inquiry. We treat writing as a process of ongoing revision, encouraging students to critically evaluate and edit their own writing. AAP Peer Learning Makes a Difference!!! AAP Peer Learning sessions are concerned with fostering excellence, not remediation. 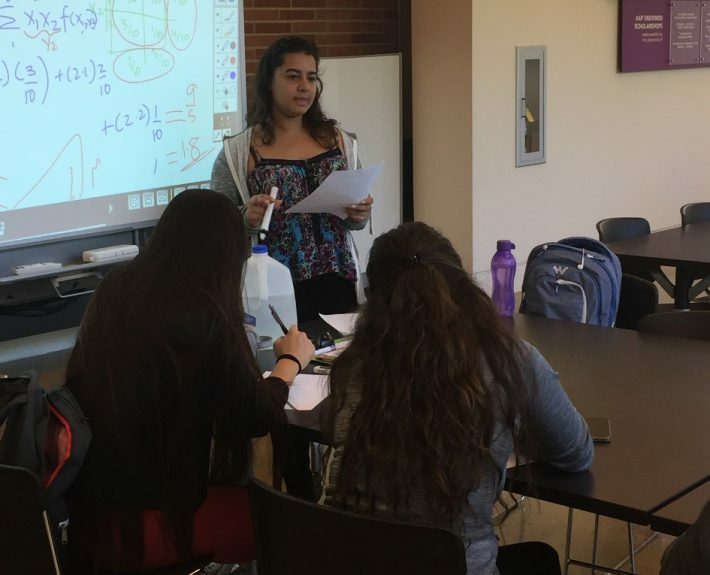 Every year, the AAP Peer Learning Unit provides free workshops to more than 5,400+ AAP students through its Math/ Sciences, and Humanities/Social Sciences Labs. 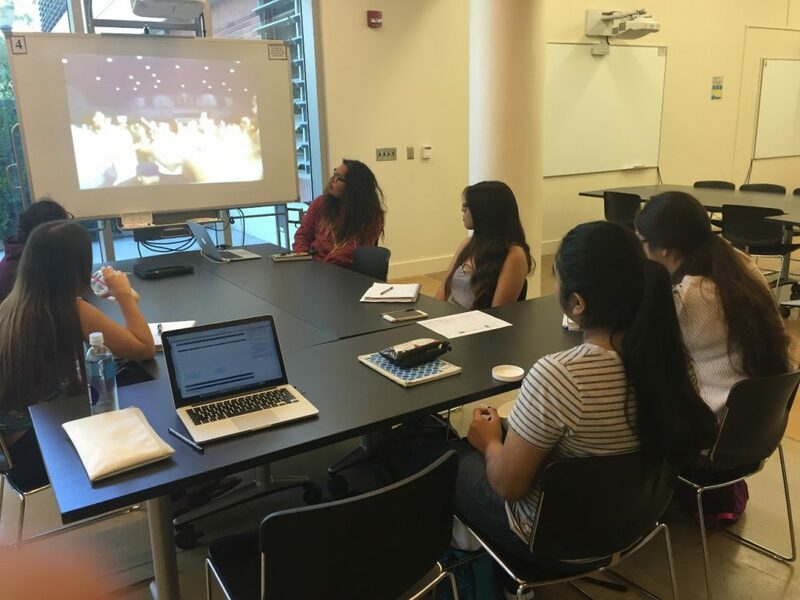 AAP Peer Learning sessions offer you a unique opportunity to receive individual attention, to shape your own educational experience, and to push yourself to academic excellence. The majority of our sessions are done in small groups of three to twelve students. Small group Peer Learning fosters discussion and allows for the articulation of different perspectives. It helps you develop the tools necessary for scholarly inquiry. It allows you to work collaboratively, to help one another, to see that you can rely on classmates as well as TA’s and PLFs, and to see that you are not alone in your personal or academic pursuits. Composition courses are led almost exclusively one-on-one and focus on your own expression and understanding. Writing is treated as a process of ongoing revision, teaching you to critically evaluate and revise your own writing. Individual sessions allow the Peer Learning Facilitator to become more involved in your learning process, and to get a close-up look at what skills, experiences, and knowledge you bring to the course. Individual sessions give you and the PLF a better opportunity to get to know and trust one another. To become active and critical thinkers, students must assume responsibility for the learning that occurs in Peer Learning sessions. 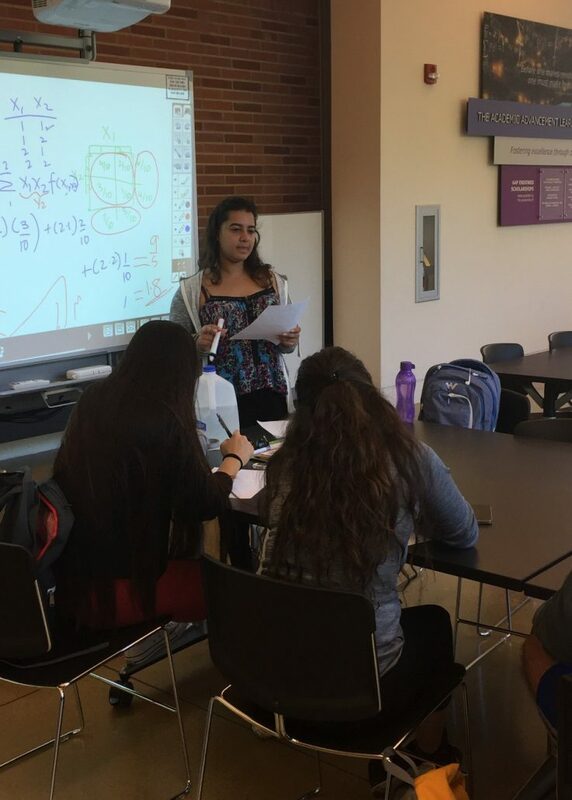 The aim is to place students at the center of Peer Learning sessions, making students responsible for interpreting materials, questioning concepts, and testing the ideas encountered in classes. AAP Peer Learning Facilitators do not reproduce the role of the instructor. In fact, they regularly encourage students to meet with their professors and TA’s. PLFs supplement instruction by getting you to engage course materials actively, critically, and independently through questioning, dialogue, and debate. The aim is to place you at the center of the Peer Learning session, making you responsible for interpreting materials, questioning concepts, and testing the ideas you encounter in your classes. Students recognize their own intellectual authority best in an environment that combines rigorous academic expectations with encouragement, support, and respect. AAP Peer Learning Facilitators encourage you to share your experiences and insights freely during sessions; they provide you with constructive feedback that acknowledges the value of your ideas and validates your potential as an aspiring scholar; they actively challenge your perceptions and help you appreciate the power and value of your ethnic and socio-economic background. Effective Peer Learning Facilitators are intellectual mentors who offer their personal support and their knowledge of campus life. Peer Learning Facilitators are sometimes asked to mediate in problems and situations that have roots in distinctly non- academic spheres: in feelings of alienation, anxiety about family expectations, financial pressures, and the like. Trained in crisis intervention, AAP PLFs provide students with information about campus resources and refer students to the appropriate campus offices. *The availability of PLF sessions for these courses vary each quarter. Effective Fall 2017, Peer Learning enrollment is divided into two assigned passes that give all students an opportunity to enroll in peer learning sessions, before an open pass for everyone. Please check MyUCLA for your individually assigned enrollment passes one week before the first week of each term. Important: Students not enrolled in classes will be dropped from peer learning sessions. Beginning Wednesday of week 1 through the following Sunday, you may experience a wait time before accessing the Peer Learning system whenever the system is experiencing a high volume of Peer Learning transactions. Your individual wait time will be displayed on the screen. You may logout of MyUCLA during your wait time and your position in the queue will be preserved. However, it is critical that you return to the Peer Learning page and are present before your wait time expires, otherwise, you will be placed at the end of the queue and assigned a new wait time. In order to allow sufficient time to wait in the queue and to complete the enrollment process, it is highly recommended that you login to MyUCLA and visit the Pear Learning page as close to the beginning of each of your assigned pass times as possible. You must complete your enrollment transactions before the end of your pass time. Help keep wait times short for everyone! 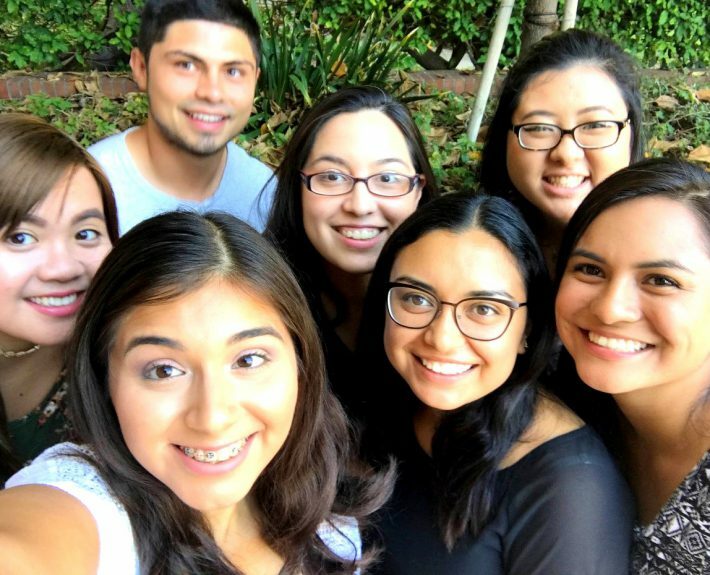 Once you have completed your Peer Learning Enrollment, please refrain from returning to the MyUCLA Peer Learning Page until your next pass begins. During first pass, students may enroll in peer learning for one class. This gives all students a better chance to obtain at least some Peer Learning. Students who do not enroll in a session during their first pass must wait until their second pass to enroll. Once the two initial assigned passes are completed, all AAP students will have an opportunity to add or drop sessions through the end of the third week. Select the appropriate term from the menu in the upper-right corner (e.g. Fall 2017). Select AAP from the Unit menu in the top-left corner, if not already selected. In the PEER LEARNING menu, click FIND A SESSION. Click on the subject area you want to enroll in (e.g. Physics), then select a course. If no session time matches your schedule, click the “request an alternate time” link. If the course you would like is not listed, we encourage you to request the course using the WISH LIST function. If you have any questions about how to sign up, please come visit us in 1214 Campbell Hall or give us a call at 310.206.7771. 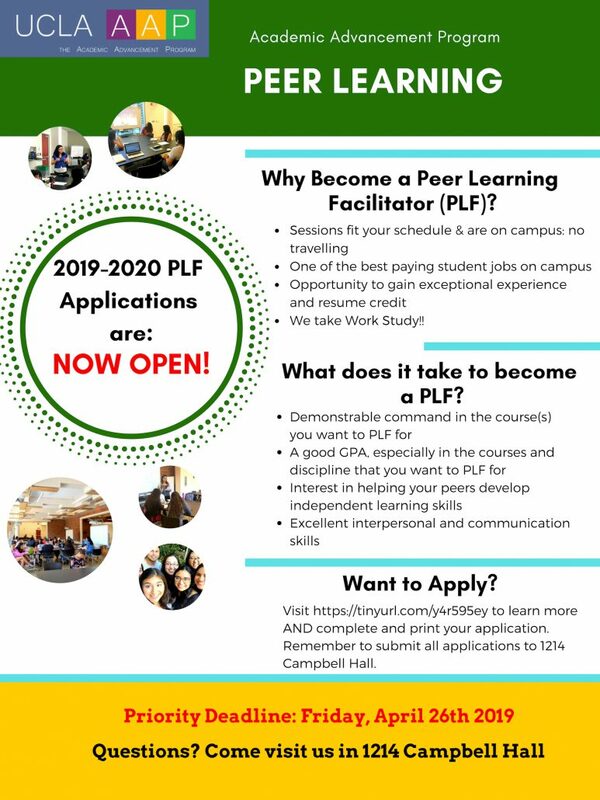 PLF Information Sessions begin Week 2! Scroll below for details. 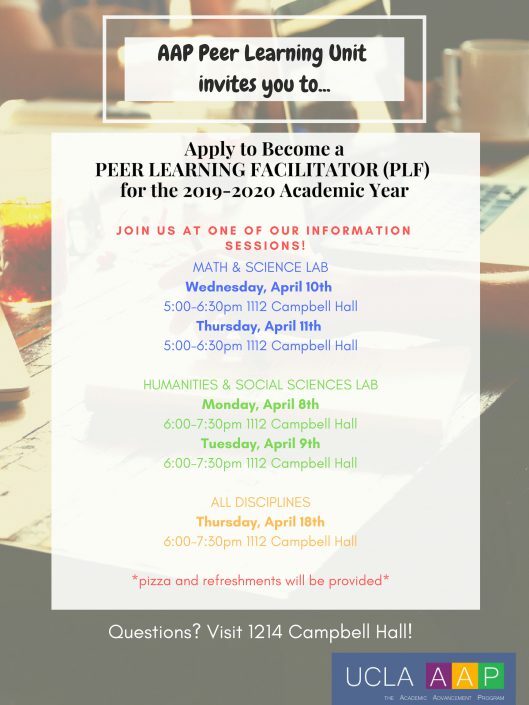 Peer Learning Facilitators (PLFs) are mainly upper division undergraduates who successfully completed courses in the Math, Sciences, Humanities and Social Sciences disciplines. They seek to help AAP Students assess and develop the reading, writing, quantitative reasoning and analytical and critical thinking skills necessary for success at the university. PLFs provide their peers with the intellectual challenge, encouragement, and personal support they need to recognize their own authority as thinkers and learners. 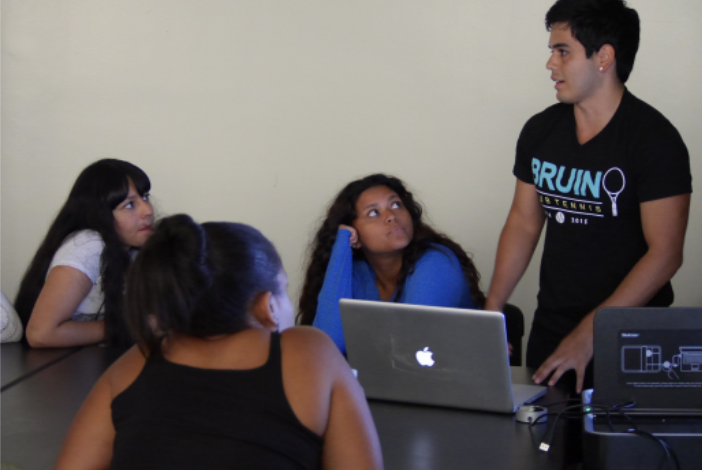 PLFs also help AAP students navigate the academic expectations at UCLA. For the most part, PLFs facilitate sessions in small groups of 3-12 peers. This approach fosters discussion and allows their peers to share, listen to, grapple with, and articulate new and different perspectives. 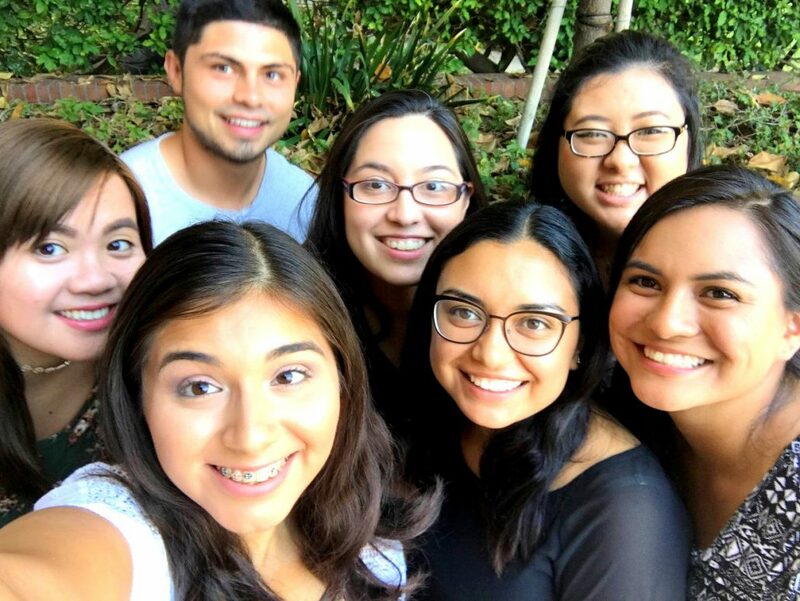 It helps AAP students develop the tools necessary for scholarly inquiry and enables them to work collaboratively through a reciprocal exchange of knowledge, and to see that they can utilize their peers, teaching assistants, and PLFs in the learning process. Sessions allow the PLF to validate and integrate the skills, experiences, and knowledge that their peers bring to the course. 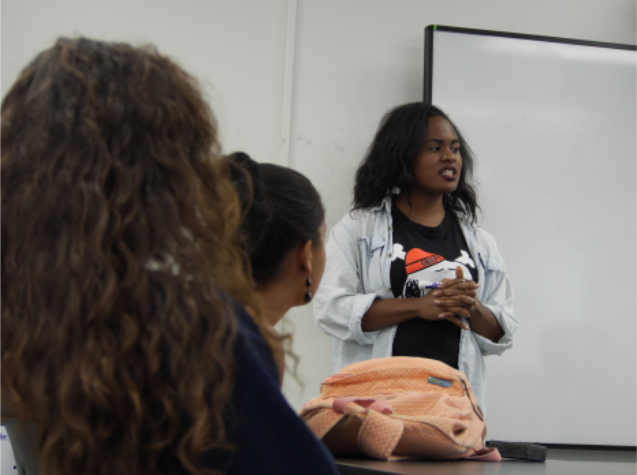 In addition, the weekly sessions allow PLFs and their peers an opportunity to form a community that can serve as a safe space of intellectual growth and empowerment. Applicants will be screened according to eligibility criteria and a selected group will be interviewed, generally by an interview committee. Previous employment with AAP and student and Supervisor evaluations will also be considered. NOTE: No online or email submissions will be accepted; Applications will be accepted on a rolling basis until positions are filled. receive written approval from their respective Lab Coordinator. If there are any questions regarding an applicant’s current employment classification status, the applicant should contact their position’s corresponding Human Resource Department. REMINDER: Priority Deadline is Friday, April 26th. Please submit applications to 1214 Campbell Hall. Many students worry about using Peer Learning, thinking that it’s remedial. Perhaps you are one. Here are some reasons students give for not using AAP Peer Learning workshops and our responses to them. Reason #1: I don’t need Peer Learning sessions because I’m not in academic difficulty. Our program is broader than trouble-shooting or remedy-seeking. AAP Peer Learning sessions are designed to enhance your learning–even if you are an “A” student. Learning is enriched if it takes place in a social context where you can test your understanding in dialogue with others. Everyone can benefit from seeing how others view things, hearing responses to one’s own ideas and the ideas of others, and receiving encouragement from one’s peers. Peer Learning sessions give you a place to assume the role of instructor as well as learner; and it introduces you to a network of other students. Of course, if you are having trouble understanding class material, Peer Learning sessions are a fine place to seek assistance. We know that people sometimes feel stigmatized when they ask for help, but it’s important to recognize that you don’t need to handle everything alone. Working with a Peer Learning Facilitator does not detract from whatever you accomplish. Reason #2: I don’t want to depend on others. Peer Learning sessions are designed not only to strengthen your academic skills, but to cultivate your confidence and self-reliance. Peer Learning Facilitators will help you articulate your ideas, not impose their own. They will help you view your work critically and guide you to look for options. Peer Learning sessions are student-centered. We encourage you and the PLF to discuss expectations, to examine the Peer Learning session relationship, and to work on that relationship as you work together on academic material. Reason #3: I don’t have time for Peer Learning sessions. Time is at a premium at the university. The quarter system is demanding. Our sessions will help you get started quicker and become more organized and focused, all of which should generate enthusiasm in your work. Reason #4: I had a bad experience with Peer Learning sessions. Perhaps you have had a bad experience with Peer Learning sessions. That does happen. Things can go wrong in human relationships. Maybe it was a personality conflict, or perhaps your expectations were different from the PLF’s. Whatever the reason, we urge you to try Peer Learning sessions again. Bad experiences are the rare exception in our program. Reason #5: If I want Peer Learning sessions, I can use my friends. We think it’s good for you to get together with other students and encourage you to do just that whenever you can. But we think you’ll find it useful to develop a relationship centered on our Peer Learning sessions. For one thing, friends may not always be available; or such sessions may have more of a drop-in quality to them than a sustained one. An ongoing Peer Learning session relationship, with a trained PLF, guided by AAP’s educational philosophy, offers you an avenue to academic excellence. In closing, though we urge you to use AAP Peer Learning sessions for a number of reasons, one very important reason remains: this program belongs to you–the students. It was formed by students like yourself, and it has been passed on to you. 90% of the Peer Learning Facilitators are AAP students like yourself. If AAP Peer Learning sessions are to continue to meet your needs, it is extremely important that you help shape its direction by your active participation.